Today we are excited to present a guest post by author Jolene Perry! I have two elementary age kids, a husband with a demanding job, a busy calling at church and books to write, release, and edit..
And then I end up on Facebook for a few minutes, reading blog posts for a few minutes, answering emails for a few minutes, and... no writing gets done. What's sad is that these are all things I can do in two minute intervals, which are a lot easier to find than real writing time. What I've started to do is to set a timer. I don't watch the clock. That problem has been taken care of for me. I know that I can totally immerse myself and that timer will tell me when I can/should/need to stand up and do something else. Normally I set my timer for 30 minutes. When my kids are home, I get them started on a show, or a game, or a snack and then I set my phone up where they can see it and set the timer. NO ONE IS ALLOWED to bother mom unless the timer is done, or they're bleeding ;-) Of course this only works b/c my kids are elementary age. I tune out of everything but my book. My writing. I don't stop to research, just stop to make notes about things I might want to check later. The purpose is to GET WORDS DOWN. When my kiddos aren't home, I generally find myself writing for ten extra minutes or so after my timer goes off. Then I get up. Step away. I think about what I want to write next, and then I do dishes or laundry or sweep or pay bills or make a few phone calls for church stuff... Anything to get me AWAY from my computer. Or anything I can do where I can still keep my mind on my characters without being at my computer. Honestly, it's rare that I can do much more than 3-4 timed writing bits in a day because my brain turns to mush - especially when I'm totally immersed. Of COURSE this would be different if I had an infant and a two year old. At the same time - it's amazing how much I can get done in 30 minutes when I use the whole 30, and even 30 minutes once a day when/if you have someone to help with little ones, is enough to write a novel. 10 minutes a day is enough - as long as you keep doing it. Anything work for you to help get words down amidst the chaos of life?? 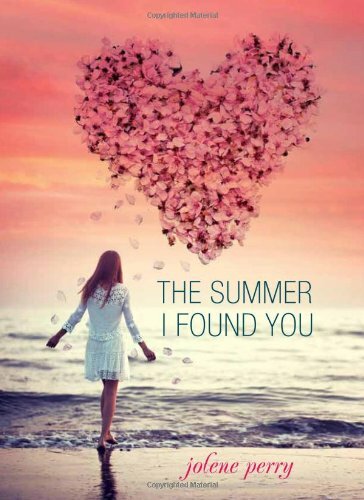 Jolene is the author of the newly released THE SUMMER I FOUND YOU (and isn't the cover GORGEOUS?). Kate had the perfect boyfriend - until he dumped her. It couldn't have come at a worse time: ever since she found out she has diabetes, she's been trying to cope. She just wants to feel normal again. THANK YOU SO SO SO MUCH FOR LETTING ME TAKE OVER TODAY!!! I love this plan, Jolene! I've never thought of a timer, but it's brilliant, especially with critiquing and housework and VT. I'm going to try that this week and see how it goes! Oh, and I cannot wait to get my hands on that book! It looks adorable! I swear I get SO MUCH MORE WRITING DONE b/c that one simple thing allows me to not think about anything else.